Take a break from BBQs and rooftop parties to take in these five shows in August. 1. Nothing expresses the joys of summer and the promise of fall like Beautiful: The Carole King Musical. There’s no better way to spend a late summer night than with this iconic '60s & '70s music performed by this incredible cast. It's your last month to see the sensational Abby Mueller; if you haven’t seen her yet, get yourself back to the Sondheim Theatre ASAP. 2. Returning to see Tony winner Julie White in A Doll’s House P2 is not optional—it’s mandatory. With a blend of comedy and drama, White unearths new layers in the piece. When she and Jayne Houdyshell discuss abandoning her children with tears in their eyes, it’s like a different show. Stephen McKinley Henderson makes a meal of Torvald, and Erin Wilhelmi finds a fascinating way into the delicate psyche of Emmy. Watching this cast, you think, how did this not win Best Play?!? 3. If you aren’t losing your $hit excited about Prince of Broadway it’s because something like Wicked or Spring Awakening was your first musical and you never bothered to learn your theatre history. This career-spanning musical about legendary director and producer Hal Prince is an event. Tony winners and nominees take on some of the most iconic musicals in Broadway history—Phantom, Evita, Fiddler, Damn Yankees, Company, Sweeney Todd, West Side Story, Cabaret, She Loves Me—all in one evening. There is no better night in NYC for a true theatre nerd. 4. If you’re looking for laughs, try The Government Inspector off-Broadway. This stylized comedy about mistaken identity and government corruption packs laugh after laugh thanks to a brilliant cast led by stage fave Michael Urie, Tony winner Michael McGrath, Tony nominee Mary Testa, and Arnie Burton. The big, drunken end of Act One alone is worth the price of admission. 5. 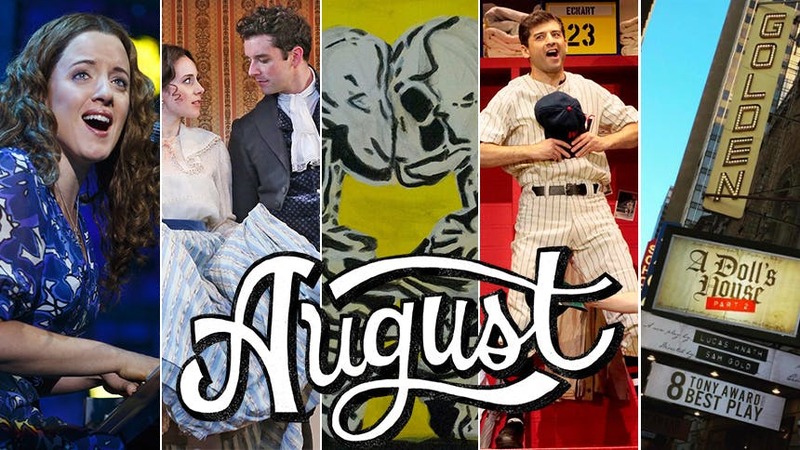 Another off-Broadway offering worth making time for in August is C.S. Hanson’s TV In My Bones, running at Theater for the New City August 9-13. The evening is comprised of six short romantic comedies about the pursuit of love for the binge-watch culture. In this marriage of Black Mirror and Almost Maine, audiences are asked to look at their own relationship with the big L word.